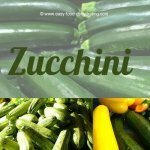 The EXCALIBUR food dehydrator company has been in business making dehydrators for over thirty years! They offer four-tray starter models all the way up to nine-tray models, and they make Commercial dehydrators too. Our site will cover the model made for home use only, namely the one shown in the photo. This EXCALIBUR® dehydrator I use is the four-model tray and offers no on/off switch. Higher grade EXCALIBUR® food dehydrator models DO have an on/off switch! These dehydrators are the only dehydrators with the unique Parallexx Horizontal Airflow Drying System. This basically means that the circulating fan is at the rear. 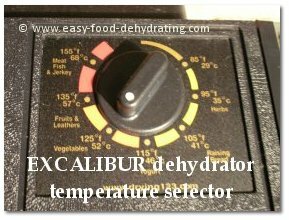 EXCALIBUR® dehydrators have their temperature selector on the top and is easy to read and use. These dehydrators have trays that pull out from the front, like a chest of drawers. You simply slide up the front panel to take it out of the dehydrator for easy access to the trays. I have found the pull-out trays to be a real handy feature/bonus of the EXCALIBUR® dehydrator as you can proof your bread dough, by taking out the top trays and just leaving in the bottom tray! NOTE: Don't try proofing bread in a four-tray dehydrator model, there's not enough height to the unit – unless you're doing hot-dog-type buns; use a 9-tray model for proofing loaves of bread! Simply set the dehydrator temperature to 115°F and let it warm up. Place a shallow pan of water on the very bottom and put one tray directly above it with the bowl of dough placed on that tray. Cover your dough with a cloth to keep it from drying out! Let it sit for up to an hour – whatever your bread recipe calls for! Keep on scrollin' to read more about rotating your trays for even drying! I have noticed that the trays in the middle dry faster, so, like the other Nesco® dehydrator I rotate these trays too! Not only from top to bottom etc, but also turn the dehydrator trays 180 degrees as the fan is located at the back of the machine and obviously dries out food faster that are closest to the fan. The EXCALIBUR® dehydrator company offers Spices and Jerky supplies, along with Books, and Raw & Living Food Helpers. You can also purchase ParaFlexx non-stick Drying Sheets for making fruit roll ups! 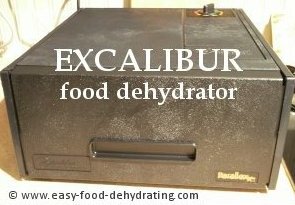 Do you already have an EXCALIBUR® food dehydrator? Simply use our easy-to-fill-in-form, directly below, to leave YOUR review for all to see, AND you'll have your very own web-page on this website auto-magically! What Do You Like about your Excalibur Dehydrator? Do you have a comment you need to share with us about your Excalibur dehydrator?